';Gripping and suspenseful . . . Child ratchets up the suspense to new heights. 'The Denver Post Jack Reacher lives for the moment. Without a home. Without commitment. And with a burning desire to right wrongsand rewrite his own agonizing past. DEA Susan Duffy is living for the future, knowing that she has made a terrible mistake by putting one of her own female agents into a death trap within a h… eavily guarded Maine mansion. Staging a brilliant ruse, Reacher hurtles into the dark heart of a vast criminal enterprise. 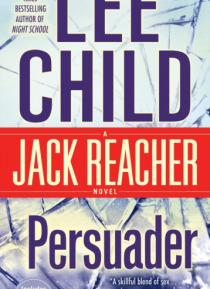 Trying to rescue an agent whose time is running out, Reacher enters a crime lord's waterfront fortress. There he will find a world of secrecy and violenceand confront some unfinished business from his own past. Praise for Persuader ';A page-turner . . . [Lee] Child's tale drives hard and fast. 'Los Angeles Times Book Review ';Wickedly addictive . . . so fast-paced it makes the eyeballs spin. 'Orlando Sentinel ';A story that will sweep you along as fast as some of the riptides Reacher survives.'St. Petersburg TimesBONUS: This edition contains an excerpt from Lee Child'sThe Enemy.